In an estimated three years, the area of the UCLA campus where Parking Structure 6 now stands will be a much different place — transformed into a hub of activity for scholars, prospective students and others from across the nation and around the globe. 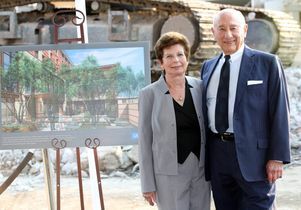 Under the cover of a large white event tent, nearly 100 people gathered at the site on Sept. 10 to mark the beginning of construction on the Meyer and Renee Luskin Conference and Guest Center, a seven-story structure that will include 25,000 square feet of meeting space and 250 guest rooms. 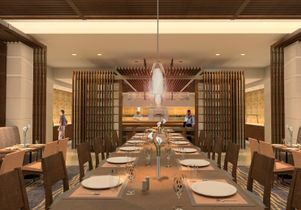 The facility, scheduled to open in 2016, will enhance civic engagement on campus and allow UCLA to attract important academic conferences and events. "I want to express our profound appreciation, on behalf of the entire UCLA community, to our dear friends Meyer and Renee Luskin," said Chancellor Gene Block. "We would not be here today without the remarkable generosity and civic-mindedness of Meyer and Renee." Utilizing $40 million from a previously announced gift from the Luskins and another $112 million in financing to be paid off over time, the self-sustaining project will not use tuition dollars or state funding, Block said. "Enhancing and deepening UCLA's engagement both near and far is one of my top priorities, and I believe this project will foster engagement at many levels," said Block. "This conference center will enable us to effectively host significant conferences that will benefit UCLA and the greater community. This will be a spectacular venue to bring together people to discuss important issues of our time." 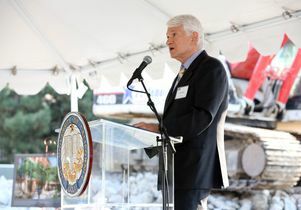 Executive Vice Chancellor and Provost Scott Waugh said the Luskin's gift is truly transformative for UCLA. "What Meyer and Renee are doing here is creating a new heart, a new focal point of UCLA," he said. "It will be our gateway to the world." For the Luskins, the gift signifies an investment in the future of UCLA and a lasting gift to the university where they met and got their start. It will serve as a meeting place for discussions, debate and the exchange of new ideas, insights, innovations and key discoveries in all fields of scholarship and exploration. "This occasion represents not only the construction of a fine building added to our campus but the promise of bringing together some of the best scholars and scientists working in a superb environment," said Renee Luskin. "It is such an exciting prospect that we envision, and today moves us closer to fulfillment. " 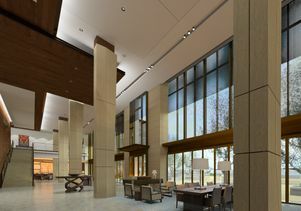 The conference center will also provide much-needed accommodations for those visiting campus for other reasons, including families of patients at Ronald Reagan UCLA Medical Center and those traveling great distances to tour the campus with their college-bound children, said Meyer Luskin. "We have a vision of parents and their potentially-enrolling child enjoying an attractive, convenient place to stay while touring our beautiful campus," he said. As a global leader in research and education, UCLA attracts thousands of national and international guests who participate in conferences and other academic events at the university. Numerous faculty members have expressed the need for such a facility, with affordable guest rooms, on campus. 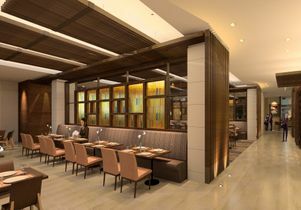 The center will not compete with local hotels for business travelers or tourists. Those booking rooms must have business with the university, similar to existing policies at the UCLA Guest House and Tiverton House, which collectively offer a total of 161 rooms and are frequently at or near capacity. The UC Regents previously approved the project's financing and design, as well as a final environmental impact report that was developed with public input following two hearings on campus. The project was also reviewed by the UCLA Academic Senate's Council on Planning and Budget, which similarily determined that the center's financing model is sound and that the university could benefit from additional conference space and affordable guest rooms. The Luskins, both graduates of UCLA, are longtime supporters of UCLA. Their generosity includes endowments for undergraduate student scholarships and graduate student fellowships, a children's clinic at UCLA Medical Center, Santa Monica, the alumni association and numerous advisory boards. 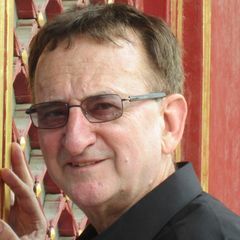 Meyer Luskin also has served as chairman of the advisory board for the UCLA Medical Center, Santa Monica. 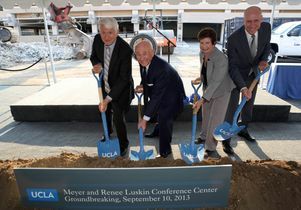 Groundbreaking for Meyer and Renee Luskin Conference Center.